Environmental education is a process by which, under the right circumstances, ecoliteracy can be achieved. In a companion essay [ Ecoliteracy – From Knowledge To Action] , I offer a critical review of the state of ecoliteracy in modern society. This review expresses concern about the effectiveness of some environmental education programs. In particular, concern is expressed about environmental education programs that are conducted in classroom environments instead of in Nature. In this essay, I present the wisdom and experience of two environmental educators, David Orr and Deborah Perryman. Near the end of the essay, I share the details of an environmental education program that I oversee. Nowhere in this process do we learn about relationships between math and history and music. As a result, we never acquire a consciousness for how things are connected. All we see is the parts. We become specialists and experts in narrow pieces of knowledge. It is no wonder that our worldview about our environment eventually becomes one of separation and dominance instead of cooperation and harmony. But in Nature, everything is connected and interdependent. All of earth’s creatures, except we humans live in a world of connections and practice interdependence. “A revolution in education is under way and it is starting in the most unlikely places. The revolutionaries are not professional educators from famous universities, rather they are elementary school students, a growing number of intrepid teachers, and a handful of facilitators from widely diverse backgrounds. The goal of the revolution is the reconnection of young people with their own habitats and communities. The classroom is the ecology of the surrounding community, not the confining four walls of the traditional school. The pedagogy of the revolution is simply a process of organized engagement with living systems and the lives of people who live by the grace of those systems. Perhaps “revolution” is not quite the right word, for it is more akin to a homecoming. We all have an affinity for the natural world, what Harvard biologist Edward O. Wilson calls “biophilia.” This tug toward life is strongest at an early age when we are most alert and impressionable. Before their minds have been marinated in the culture of television, consumerism, shopping malls, computers, and freeways, children can find the magic in trees, water, animals, landscapes, and their own places. Properly cultivated and validated by caring and knowledgeable adults, fascination with nature can mature into ecological literacy and eventually into more purposeful lives. A curriculum that enables young people to discover their own homes as described here is not an add-on to the conventional curriculum. It is rather the core of a transformed education that enables young minds to perceive the extraordinary in what we mostly mistake for the ordinary. There has never been a time when we needed the kind of transformation described here more than at the end of a century of unprecedented violence and at the dawn of the new millennium. We need it, first, to help open young minds to the awareness of the forgotten connections between people, places, and nature. But we need a transformed curriculum and schools as the start of a larger process of change that might eventually transform our communities and the culture beyond. If this occurs, and I believe that it will, it will begin with small everyday things: freshwater shrimp, the trees along the banks of streams, the lives of ordinary people, the stories we tell, and the excitement of children. Here is further commentary by David Orr entitled “Environmental Education and Ecological Literacy” that was published in the Holistic Education Review. All education is environmental education. Conventional education,for the most part, excludes our dependence on nature. Environmental issues are complex and cannot be understood through a single discipline or department. Interdisciplinary environmental education remains an unfulfilled promise because it was taught in discipline centered institutions. The study of place is a fundamental organizing concept for education. Formal education prepares students to reside, not to inhabit. A resident is a temporary occupant. People who do not know who they are because they do not know where they are. However, the inhabitant and a place mutually shape each other. For inhabitants, education occurs in part as a dialogue with a place and has the characteristic of a good conversation. Good conversation with nature has the purpose of establishing what is here, what nature will permit, and what nature will help us do here. Environment education should change the way people live, not just how they talk. Real learning is participatory, experiential, and interdisciplinary, not just didactic (instructing). The flow should be two ways — between teachers; who function best as facilitators, and students, who are expected to be active agents in defining what is learned and how. Experience in the natural world is both an essential part of understanding the environment and conducive to good thinking. Understanding nature demands a disciplined and observant intellect. The educated person has the knowledge necessary to comprehend interrelationships and the attitude of caring or stewardship. Competence can be derived only from the experience of doing and the mastery of “practice”. Knowing, caring, and practical competence are the basis of ecological literacy. Ecological literacy, furthermore, implies a broad understanding of how people and societies relate to one another and to natural systems, and how they might do so sustainability. Ecological literacy is to know that our health, well-being, and ultimately our survival depend on working with, not against, natural forces. Ecological literacy is to understand the speed of the crisis that is upon the human race. It is to know magnitudes, rates, and trends of population growth, species extinction, soil loss, deforestation, climate change, ozone depletion, resource exhaustion, air an water pollution, toxic and radioactive contamination, resource and energy use, that is the vital signs of the planet and its ecosystems. Ecological literacy requires a comprehension of the dynamics of the modern world of humanity. It requires a thorough understanding of the ways in which people and whole societies have become destructive of the natural world. The ecologically literate person will appreciate something of how social structures, religion, politics, technology, patriarchy, culture, agriculture, and human cussedness combine as causes of our predicament. Ecological literacy requires an understanding of the major importance of sustainability. The concept of sustainability implies a radical change in the institutions and patterns that we have come to accept as normal. Sustainability implies a new ecology that is the basis for the redesign of technology, cities, farms, and educational institutions as well as a change in metaphors from mechanical to organic, industrial to biological. Environmental literacy requires a broad familiarity with the development of ecological consciousness which includes efficient resource management, and a broad search for pattern and meaning including issues of value and ethics. It requires more durable directions toward prudence, stewardship, and the celebration of the Creation. I have had the honor of working with Deb Perryman, an Elgin, Illinois high school teacher who, among many honors, received the 2004 Illinois Teacher of the Year award and the 2014 Environmental Educator of the Year award by the Environmental Education Association of Illinois. She was recognized for implementing environmental education in and out of the classroom, including using 35 acres of natural space outside of Elgin High School as an instructional tool. Her story is documented by PBS in an excellent Youtube video . Her teaching style incorporates both indoor and outdoors classrooms. Hope For Mankind’s Future Comes From Instilling A Deep Consciousness For An Interdependent Nature In Our Youth. One of the most important conservation strategies available to we humans is the creation of a deep consciousness of Nature in the minds and hearts of our youth. The youth of the world, age 25 and younger, represent 50% of the human population. Our youth are generally untainted by the cultural disconnection from Nature that is characteristic of most adults over age 25. With our youth, we have the opportunity of building a legacy for future generations that will serve to guide young people along a pathway of preserving and sustaining Nature for the benefit of life on Earth. All life on Earth depends upon the flow of energy throughout our Earth’s ecosystems. The pathways for this energy flow touch every living organism on Earth including we humans.These pathways are interconnected and interdependent. By creating a human consciousness for the idea that nothing in Nature lives in isolation and that everything is interconnected and interdependent , we lay the groundwork for respecting and conserving the very basis of life. We can instill this connectivity consciousness in the souls of our young people through both example and environmental education that is conducted outdoors. While I am a marine biologist, I am not a trained teacher. Much of what I do as a teacher/mentor has developed through direct experience. One of the most powerful lessons that I have learned is to teach outdoors because my students will respond more effectively. The reason is that the outdoor learning experience is BOTH information-based and emotionally-based. Ideas take root in young minds when they touch, feel, taste, and smell. When I given a seminar or class indoors, my students will always exhibit a resistance to learning. Either they won’t read the assigned material or they will show signs of inattention. But, when I conduct a class outdoors, I usually give the students a bag or box to collect things that relate to the material I want to teach. They students turn the experience into a treasure hunt. They are proud of what they have found. And, we keep the material so that we can review our field trip in the classroom during the next class session. The collected material is also used for the student teaching experiences discussed below. If we are doing our work on a beach, we will always go in the water for a swim after class. I teach energy flow in Nature inside a mangrove forest at a local estuary. We start by outstretching our arms to feel the sun’s energy. We then work our way down through the mangrove tree as we search for creatures that are acquiring energy. We work ourselves all the way into the root system and the surrounding detritus as we note examples of energy flow and energy transformation. As a review, we then draw food web diagrams to take back to class with us for review. By working in this manner, the ideas of energy transportation and transformation become incorporated into the student’s knowledge base. They see, feel, and touch the ideas of interconnection and interdependence first-hand. My primary contact is with senior level high school students. However, in the course of their learning experience, senior high school students learn to become the teachers of younger students from 4th grade primary through junior high school. My group of student-teachers are called the “Green Team”. They both manage and teach this program. I am only the mentor and technical adviser. There is a certain magic that takes place when my Green Team students teach younger students. Normally frisky 4th, and 5th graders listen with great attention when the Green Team is doing the teaching and allowing everyone to touch, feel, and listen. The young students listen and respond with zeal. First,the Green Team provides a 45 minute introductory talk to the young students in their classroom about Nature’s energy flow and about what to expect during the upcoming field trip. A box of specimens (plant parts, skeletons, rocks, etc), previously collected by my students, are brought into the classroom so that the young students can view, touch, taste, and smell while the talk is being given. This session ends with instructions about safety and behavior during the field trip. First, the young students play the “string game”. The string game is an activity that can be used as a demonstration and simulation of connections in Nature. In this simulation, students represent plants and animals living in the habitat which is being visited. Each student has a picture of who he or she is representing in Nature. Sitting in a circle, students connect themselves to each other using a ball of string to represent the ways in which they depend on each other for their energy flow. As they make connections, the string forms a visual web of life. In the final part of the simulation game, the students will experience what happens when a connection is destroyed. Here is an excellent 8 page PDF document that describes the process. 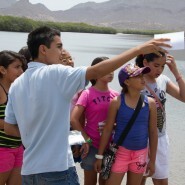 The young students then visit the nearby mangrove forest and focus on energy flow as described in an earlier paragraph. Near the end of the field trip experience, the young students will review what they have learned by sitting in a circle and answering the question: “What Did You See? Throughout this experience, the teachers and the learners are building legacy. My Green Team teachers are passing on what they know to a group of younger students. The hope is that some day the younger students will pass on their inspired knowledge to others. The Green Team program is conducted at a local private kinder through 12th grade school. So, there is the opportunity for the younger students to become teachers when they reach high school. Furthermore, we are hoping to expand the Green Team program to other schools in the community.